Manuel Miranda is a practically unknown painter. With regard to his early life it is only known that he was born in Grazalema and that he trained at the Academia de Bellas Artes de San Fernando in Madrid. His output focused primarily on historical subjects and portraits and he is known to have executed a portrait of Queen María Cristina, a work now in the Monastery at El Escorial (Patrimonio Nacional, inv. no. 10014972) and which is mentioned in a 19th-century description of the monastery-palace. 1 Miranda also executed two portraits of Spanish monarchs for the series “Chronological Series of the Monarchs of Spain”, namely the portrait of Suintila (Museo Nacional del Prado, inv. no. 3767) and that of Don Sancho García IV, King of Sobrarbe (Museo Nacional del Prado, inv. no. 3522). This association with court circles resulted in his professional collaboration with the painter Fernando Brambilla, for whom he painted the figures in the latter’s “Views of Aranjuez”. According to Sancho Gaspar these figures are more expertly painted than the ones that appear in other series by Brambilla such as the one devoted to La Granja. 2 The last known information on Miranda relates to his participation in the National Fine Arts Exhibition of 1864 in which he obtained an honorary mention. Manuel Miranda was also involved in the production of drawings for a series of prints illustrating the First Carlist War. A print after one of them is known, depicting the The Atrocities of Cabrera and his Followers at Burjasot (Madrid, Museo Romántico) dating from 1842. In the manner of Goya’s Disasters of War it offers a critique of the atrocities carried out by General Cabrera in this small village in the Valencia region where most of the population was shot. The present drawing depicts a Vision of a Witch. It is executed using fine, rapid strokes of the pen that define the areas of shadows with zig-zagging, parallel lines that are emphasised to a greater or lesser degree depending on the desired intensity of light. In the foreground is a kneeling man with his hands joined as if in prayer with a dog by his side who appears to be barking in fright. Behind them, in the middle ground, is an enigmatic figure of a man with a beard and moustache wrapped in his cloak and seemingly trying to hide. Both the kneeling man and the dog are looking up to the sky in which we see a flying witch on a broomstick. The scene takes place in a sketchily defined landscape with lightly indicated rocks and shrubs. On the left is a small still-life motif of pots and pans that seems to suggest that the figures in the foreground are preparing some sort of potion in order to make the witch appear. The scene as a whole follows the Goyesque tradition of satire and social critique. Rather than being inspired by that artist’s Disasters of War, like the print of Burjasot mentioned above, the present drawing looks to the prints of Los Caprichos and to canvases such as The Witches’ Sabbath and The Witches (Madrid, Museo Lázaro Galdiano). The present work would thus appear to be an acerbic, critical allegory of the superstition and absurd beliefs typical of the 19th century. In Los Caprichos, Goya aimed to promote Enlightenment ideas and reason in the face of “vulgar lies sanctioned by custom and ignorance” 4 and half a century later Manuel Miranda seems to follow him in a continued critique of fraudulence. It should be noted that the subject of witchcraft persisted in the iconography of mid-19th-century Spanish artists. 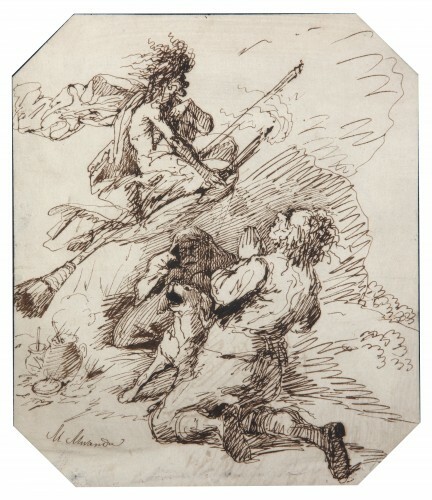 The continuing success and increasingly high prices that Goya’s works began to command encouraged other painters such as Eugenio Lucas Velázquez to depict this theme in various compositions such as Witchcraft in the Cave (Madrid, art market) and Allegorical Caprice (Madrid, Museo Lázaro Galdiano). Another artist who used this iconography is Eugenio Lucas Villaamil in Witchcraft (Madrid, Museo Lázaro Galdiano). The purpose of the present drawing is unknown. If it was executed as a preparatory sketch for a subsequent canvas or as a design for a print the final work is unknown or was not executed. What is clear, however, is its stylistic as well as technical dependence on Goya. The man wrapped in his cloak in the middle-ground is probably derived from the figure in the centre of Goya’s painting of Witches in Flight (Museo Nacional del Prado, inv. no. 7748). Similarly, the figure of the witch seems to derive from Capricho number 68, entitled Linda maestra. The position of the broom, which creates a diagonal that crosses the entire scene, and the skinny body of the witch with her shrivelled skin would seem to confirm this idea. Rotondo, Antonio, Descripción de la Gran Basílica del Escorial. Madrid, Imprenta de la Galería Literaria, 1861, p. 186, no. 436. This work is also referred to by Ossorio y Bernard, Manuel, Galería Biográfica de Artistas Españoles del siglo XIX, vol. II. Madrid, Imprenta a cargo de Ramón Moreno, 1869, p. 54. Sancho Gaspar, José Luis, Las Vistas de los Sitios Reales por Brambilla. Aranjuez, Salón de Cabras, la Isabela. Madrid, Patrimonio Nacional, Doce Calles, 2002, p. 9. Pantorba, Bernardino de, Historia y Crítica de las Exposiciones Nacionales de Bellas Artes celebradas en España. Madrid, 1948 [Madrid, Edición de Jesús Ramón García-Rama, 1980], p. 441. Carrete, Juan, “Francisco de Goya. Los Caprichos” in Goya. Los Caprichos. Dibujos y aguafuertes. Madrid, Real Academia de Bellas Artes de San Fernando, 1994, p. 13.